I'm Pissed Off and Bewildered. What's In It For You? I was going to write today's newsletter about Corporate Rebel Summer Camp which I will still do briefly at the end. I was so disappointed, bewildered, and frankly pissed off this evening that I had to write to you immediately. Before I tell you THE INCIDENT, here's the point. You live in a community (your home, your workplace, your town, your neighborhood, the world). There are easy ways to enhance your community, and ways to shred them. It takes about 3 seconds of thought to be an enhancer and yet people thoughtlessly shred their communities ALL.THE.TIME. It's a beautiful night. My daughter and I were walking across a soccer field with our dog (pictured above) to drop her (daughter, not dog) at a game with the neighborhood league. Another mom walked up to me and in a nasty voice said, "Dogs aren't allowed on this field." And then she said something rude that I'm not going to repeat, because I don't want to perpetuate the bad juju. She stomped off while I was muttering something like, "I had no idea…"
Let's be clear. I appreciate that she told me the rule. This was the first time I'd been to that field, and I'd seen lots of families bring dogs to soccer games in other places. I promptly took my dog home not because I wanted to please this woman, but because I understand the rule and am happy to comply. And, I was angry and bewildered. Are you as confounded as I am when nasty confrontations happen in public? I'm always looking for the learning when something makes me this angry. Community matters, and we create it. This woman could have made the same point with a smile and a statement like, "You may not know this but….." That would have enhanced the sense of community rather than shredded it. Your tiny, everyday choices matter. That woman was able to be nasty to me because she made up an unconscious or conscious story that I'm a jerk or an idiot or somehow not like her. That kind of attitude on a large scale has led to much violence in the world. Unconditional Positive Regard (UPR). It's good for your health, enhances your mood, and makes our communities stronger when you start with positive assumptions about other people. This is called unconditional positive regard. It takes no time to implement and can completely change your world. Talking to a friend and writing you calmed my reaction and brought me back to a place of peace and acceptance... And stopped me from marching over to her and shredding our community myself with some carefully selected words. In 30 minutes, I was able to offer her some quiet UPR (tired, hard day, hates dogs, is working with her coach on speaking up). Here's where I could try to make a graceful transition about community and the Corporate Rebel Summer Camp and I ain't got one. Instead, I'm just going to be clunky and shift gears on you. 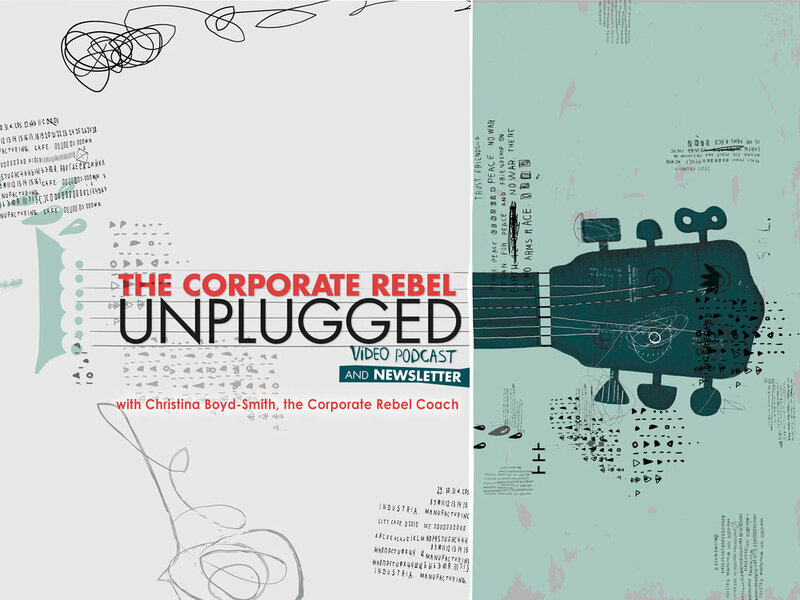 The Corporate Rebel Summer Camp kicks off next week, June 15 at noon CT with aFacebook Live Campfire Conversation with my friend, colleague, and rebelicious sister, Sandra Possing. We'll be talking about Real Rebellion in three Facebook Live sessions throughout June. Each session will have a theme and is open to the public. (Invite your friends and colleagues. No one has to sign up to participate. Just tune in here.) You can comment, ask questions, and share opinions. We're not selling anything. We're simply building community and inviting you to think about your Real Rebellion this summer! The Campfire Conversations are on Thursdays June 15, 22, and 29 at noon CT. Mark your calendar now and join us here on Thursday. If you've had a community shredding confrontation, I'd love to hear about it. Especially how you responded. And come to the Facebook Live Campfire Conversation on Real Rebellion next Thursday! P.S. You and everyone you know is invited to join me and my rebelicious colleague, Sandra Possing for our public Campfire Conversation on Facebook Live on June 15, June 22 and June 29 at noon Central Time to chat about your Real Rebellion. Tune in here.